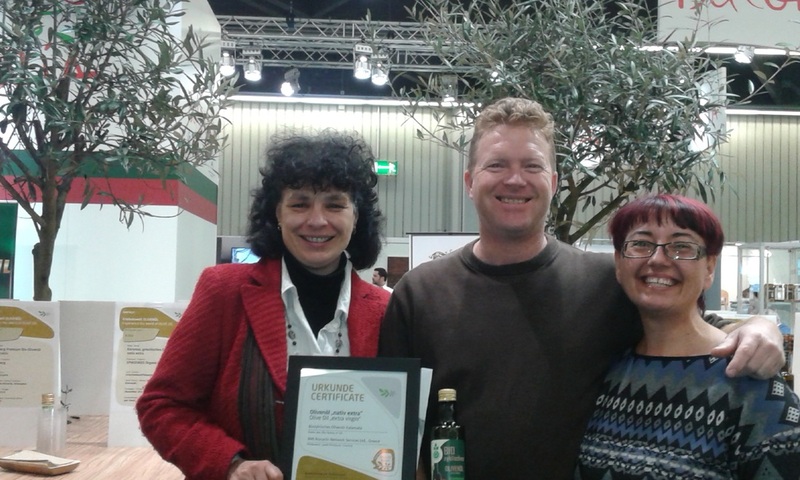 Naturland-certified biocyclic olive oil received again a recommendation! The Biocyclic olive oil of the Greek Naturland-partner Biocyclic Network received again a recommendation at the “BioFach 2015 Olive Oil Award”. For three days trade visitors and panelists could taste and judge 63 different oils that took part in the “Olive Oil World of Experience”. The awarded pure organic Βiocyclic extra virgin olive oil originates from a small scale family driven olive grove in the region of Kalamata cultivated by members of the panhellenic biocyclic growers’ network "Biocyclic Network". The Biocyclic Network consists of about 100 small scale family driven organic operations all over Greece and Cyprus. Technical support, quality and export management, as well as customer communication are centrally coordinated for the growers through different initiatives and cooperatives. Since 2010 the Network is a partner of Naturland in the sector of fruits and vegetables. The awarded olive oil at BioFach 2015 is produced by Stylianos Kotrotsis and Efthymia Gazeta-Kotrotsis in Koryfasio near Kalamata. It is exclusively produced from olives of the “Koroneiki” variety and bottled directly on the farm. This was not the first time an olive oil of Biocyclic Network, that sells its olive oils as “single farm product”, won an award at the “BioFach Oilve Oil Award”.